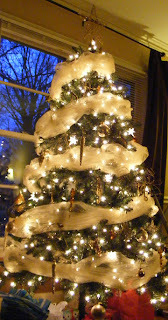 How about a tour of my Christmas decorations? 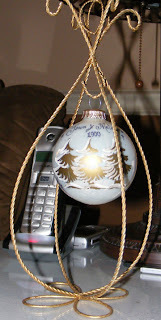 This is an ornament we got for our second year together - because we were too broke the first year - during a trip to Dollywood's craft fair. We have two more on the tree, another with just the two of us from the next year and one from the year Little AM got here. Part of Jason's Christmas village, which sits atop the entertainment center. 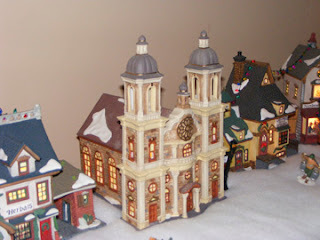 We had this up for a couple of years before we (meaning my ordained minister husband) realized our town had no church. Heathens! Obligatory tree shot. 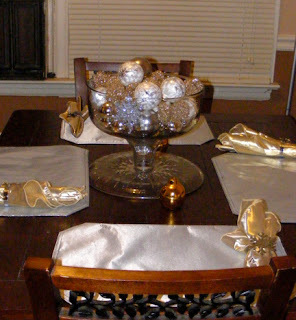 Much the same as last year, but with gold and brown ornaments instead of silver and gold. And yes, there's a star on top, you just can't see it in this shot. 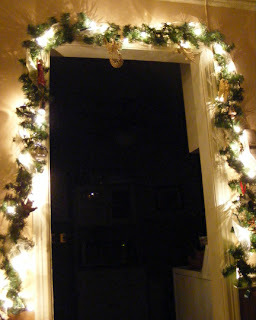 Good thing I shot this when I did, because all the lights blew out simultaneously a couple of days ago on this garland. It's where all our "special" (read: not matching our tree) ornaments live. 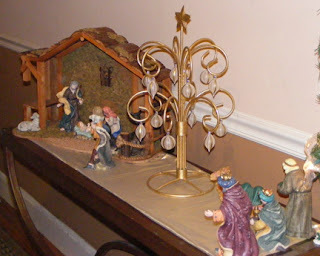 Our nativity, which, for the sake of accuracy, has the Magi far away from the baby. Because there's every reason to believe he was a toddler when they finally got there, and we have to be BC (biblically correct) at my house. My table - in a flash of inspiration (and trying to figure out what to do with all those silver ornaments that weren't going on the tree) I flipped my cake dome over and filled the resultant bowl with all sorts of silvery things. 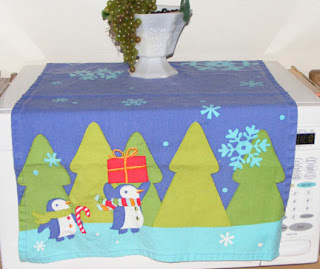 My kitchen - the penguin stuff was a gift last year from my Aunt Debi. 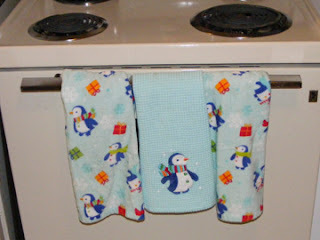 There are also cute little penguin-shaped pot holders, but I think they were dirty when I was shooting these. 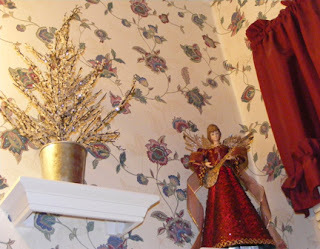 Yes, I have a tree and an angel overlooking my toilet. Truth is, we used to get a new angel every year, so I use the old ones to decorate around the house. And yes, I have a trifle bowl full of ornaments and some candles on the back of my toilet. 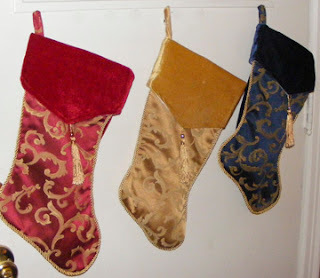 I learned during a tour of homes a few years ago that the secret to "real" Christmas decorating is to put a little something in every room. 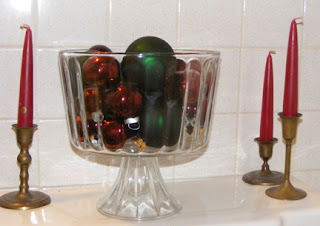 Besides, I had to find a use for the green and burgandy balls I no longer use on the tree. And finally, AM's room door. 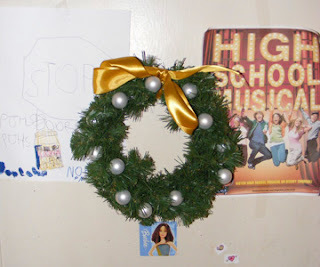 I made the wreath a couple of years ago using Dollar Tree materials and some spare ribbon I had hanging around. You can also see her affinity for stickers, High School Musical, and signs that tell folks to keep out. Thanks for stopping by - I think I blew Blogger's mind with all these pictures! How the heck did it get to be Thursday already? Huh? And, are the holidays over yet? Anyway. That's not what you came here for. You came here to see the damage from my holiday eating frenzy. Half a pound. That's the damage - I gained half a pound. I now weigh 158.5, for like the bazillionth time. Which I suppose isn't bad, considering that one of the ladies tonight gained seven pounds in the past week. All in all, I guess half a pound isn't bad. Even our WW leader gained a pound this past week. I also know that if I hadn't been cognizant of what I was eating, it would've been much, much worse. First off, Merry Christmas and Happy Boxing Day and all that. I hope everyone had a good holiday - we did pretty well, until the part where I got into a major fight with my brother, but at least we talked afterwards and did something my mom's family never does in all their fighting - dealt with the issues. You'll never believe what I unwrapped Monday night at my mom's house. Let me give you a hint: it came in a big box, and it's named after an insect I normally can't stand. Yes, my husband bought it at the beginning of December, when it was still $119, and hid it at my mom's house. Hid it. Because he knew that I'm nosy and if it had been around here I would've found it sure enough. I've already used it to do a page! It's all very exciting. Not exciting, however, has been my eating over the past few days. Boy, oh boy, do I ever dread weigh-in tomorrow night! But, I've done the crime (and eaten the brownie pie) so I have to be willing to do the time. And next week is New Year's. Time for a fresh start. I also got a panini press from my mother, so I guess I'd better figure out how to make some fancy flat sandwiches. And I'm really thankful tonight, too, because our office manager Faye's son and daughter-in-law were in a terrible wreck Saturday night, wherein they flipped their SUV and were thrown - her out the window, and him into the back seat - because they weren't wearing their seatbelts. They're OK - he has a black eye, and she has a broken nose and a fractured pelvis, but it could've been so, so much worse. Just be in prayer for them, though - they're young (around my age) and physically resilient, but she's a hairdresser and is losing money every day she's not behind that chair. Oh, yeah, they're converted seatbelt wearers now too. Pray that sticks! She finally got to come home from the hospital today, because she was able to walk across the floor of her room. Now she'll need physical therapy, but I figure since they're both alive, they can pull together and work through that too. And knowing they were going to be OK was the best Christmas present that Faye could get. Here I sit - in my jammies, having just eaten a bowl of that amazing Quaker Simple Harvest oatmeal and sipped a cup of peach herbal tea (a gift from our wonderful office manager) and trying to figure out how to not leave the house until we go to my mother's tonight. My mother's house, where major rennovations are now going on, and will hopefully be finished before tonight. It's like an episode of a reality show, except with less money and more complications. Anna Marie had quite an adventure last week - my dad came and got her Wednesday afternoon from my job, and took her to McDonald's and to the movies to see Alvin and the Chipmunks. Then, she spent the night with my parents, and went to the auction Christmas party - where she left with Amanda. Who took her to the mall and put her on the carosel, and bought her Chick-fil-A for dinner. And then my mom came to get her the next day, and took her back to the mall. And to Moe's to eat! And Jason and I went shopping after I got off work, and AM was still with mom, so, what the heck, she spent the night again. Saturday afternoon AM and I put together a gingerbread tree (because that's all that was left in the stores, because I'm a big huge procrastonator and didn't get a house) and watched Elf. Pictures to come later, when I'm not too lazy to dig out the card reader. We did that while Jason was at my mother's, helping with the aforementioned rennovations. Anyway, Jason is about to head to the bank (and it closes at noon today) and I've asked him to take my car, because it needs gas. And to stop by the grocery store to get some fruit for the stockings. Like I said - trying not to leave the house until tonight! Here is the obligatory YouTube video of Linus explaining the Christmas story. Because I love it, and because, in a desperate grab for ratings, the network played it in NOVEMBER this year and I missed it. Guess I should start calling it the "Official whenever-I-get-around-to-it Weigh-In." Thursdays are such a bad night for me. I didn't stay for my meeting last night, and I justified it by saying I was coming home to do housework while Little AM was at her Aunt Manda's house for the night. Except that when I got home and ate dinner, I was pretty exhausted. And I realized that maybe the house wasn't as bad off as I thought, and that maybe Jason could pitch in and do a little. I have no idea what I'm going to do for eight hours at work today - I got everything done yesterday because of early deadlines, and we have our Christmas breakfast, but other than that - nothing. And I can't leave at lunch, because my bosses are coming through this afternoon on their way to fly to see their son in NYC for Christmas. Guess I'll have to get around to that filing I've been putting off after all. Guess what I did Monday night. 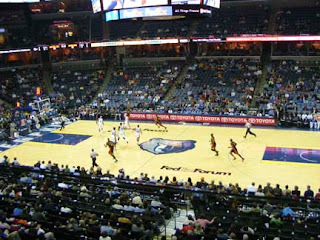 That's right - I went to a Grizzlies game! Without Anna Marie! For free! In the Club Level, which would've set me back $85 if I'd had to buy the tickets, but one of Amanda's friends had gotten her hands on them for free, and that's a bargain at twice the price. Seriously. This shot was taken with no zoom. None. Again with the no zoom! Ok, so this one had a little bit of zoom. But still - not possible from the $5 game day tickets we normally have! Oh, did I mention the best part - they have a waitress come around, and she takes your order from a menu in your (LEATHER) seat, and she brings it to you. Genius! Now I know a little of how Valerie felt when she got into that luxury box. 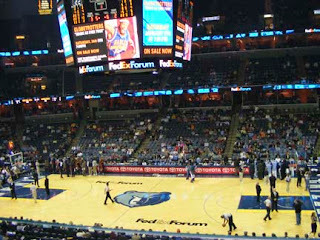 Especially since we were just below the boxes, and went into the same councourse as those lucky box-folk. I did not, however, get a picture of what you could either consider the best, or worst, part of the night, depending on your viewpoint. 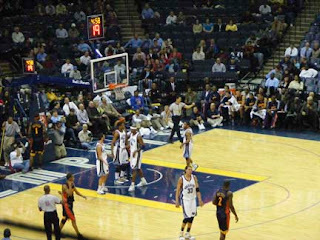 Like most sporting events, the arena folk have different promotions and games during the time-outs. One of those is sponsored by Mazola Pure cooking spray, and everyone is encouraged to get up and dance. The camera zooms in on different dancers, showing them on the Jumbotrons, yada, yada, yada. Everything was all good, and I was enjoying seeing a 400 lb. guy doing the moonwalk like he weighed 100 lbs. soaking wet. Then the camera cut to a guy and a girl. The guy was dancing, and then the girl started. And then she flashed the entire stadium. Just lifted up her shirt, and showed us the girls. No bra. No tank top. There they were. In living color, and several feet high. Poor Amanda, she missed the whole thing because she was texting a friend who'd scored plaza-level (that's nearly on the floor folks) tickets across from us. Again, for free. 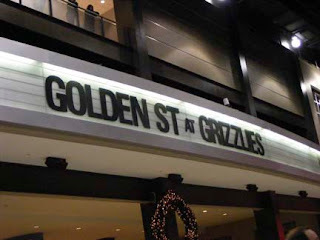 The crowd went wild - and then all the dirty rich old men on the floor started careening their necks, trying to get a better view. And Amanda's friend across the way stood up and started yelling for her to come back. On to better things. Or not, depending on where you're sitting. 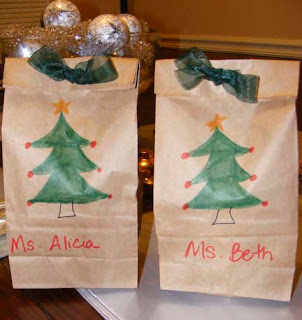 I got all crafty-fied last night, putting together gifts for Little AM's teachers. I probably should've taken pictures of the actual gifts, but they were clear plastic glasses with snowmen on them I found at Target, and filled with Hershey's miniatures. I wanted a way to wrap them so that I could put them in her backpack and they wouldn't fall out. So I grabbed these paper bags out of the cabinet, drew on them, and punched holes in the top so I could run ribbon through. They are also teh awsum, no? And yes, I take all the credit for Anna Marie's mad art skillz. She got out at 11:45 this morning, after having her first-ever school bus ride to her first-ever field trip (to the movies?) and I had to bring her to my office because Jason's in Memphis. And I did what any self-respecting mother would do in my situation: packed the DVD player and headphones. She barely moved for two hours. Then, when she decided she wanted to do something else, I suddenly remembered that my dad was off this week, and that he was at home, that home being a mere six miles from my office. Ding ding ding! Time to call in Papa. I don't know what they're doing, but it's a safe bet that she's enjoying whatever it is - Lincoln Logs, checkers, jump-on-Papa's-enormous-tummy - more than she would being here. I was going to post a Dan Fogleburg video, but I couldn't find one I liked. Then! 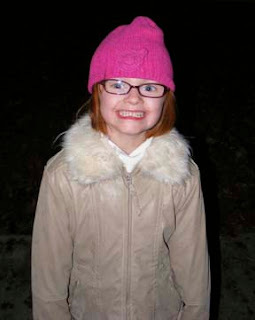 I remembered that I'd made a video of Anna Marie at the Christmas program at my mom's church last night. And, that it was MUSIC! Which makes it perfect for Music Monday! You can't hear her singing - in fact, I'm not entirely sure she isn't just moving her lips. They also sang Away in a Manger, but she was turned around the entire time reading the words on the screen. Because I'm a bad mom, and haven't taught them to her already. The whole thing was based on a news broadcast, live from Bethlehem, but the actors didn't say their lines - just lip synched along with the pre-recorded soundtrack. 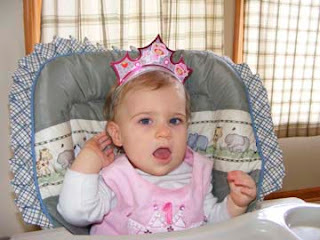 Little AM also had a bolt of fabric on her head, held in place with a piece of twine. (Her role was "traveler' and she told me that she just walked around in circles. Which is EXACTLY what she did.) But then the twine broke, and the fabric kept falling. And no one helped her! And mom and Amanda and I were powerless to do anything except laugh as my poor little one just kept trying to get the fabric to stay on, and it just kept sliding off. Because who thinks polyester is a good choice for putting on top of someone's hair? Anyway, here it is. For what it's worth. Enjoy! I'm only gonna say this once: I lost a half a pound! Now just a pound and a half to go to lose what I've gained in the past two weeks! For those of you who are keeping score, that makes my weight 158. I lost 80.5 pounds, but have gained back a total of 1.5 pounds, so (doing math in my head, wait a minute) that makes me down 79 total. Guess all that extra water helped! I almost broke down in tears in Walmart this morning. You may remember that they were on sale for $119 (normally $184) at WM the day after Thanksgiving. Much as I wanted one, I didn't have the funds. I figured they'd sell out in a jiffy. A couple of weeks ago, I noticed some on a shelf in the ever-shrinking craft section at our Senatobia store. For $119. They weren't selling AT ALL. Jason promised he'd buy one as soon as he got a check he was expecting for building a website. Back to today - I was in there before work. They still have about a dozen of them, but they've jacked the price back up to $184! 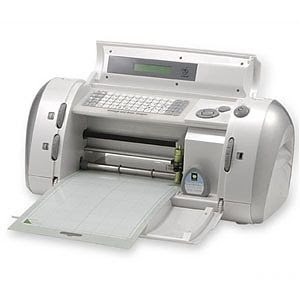 Now, I know, that's still a good deal for a Cricut with two cartridges. But when they've been $119 for a month, and the only thing standing between one of them and a spot under my tree was a group of people in South Carolina, well, it's just the principal of the thing. I've been pretty bummed about it all day. And wondering what I need to request for my consolation present. Amanda suggested I boycott them, but that's really not an option. Unlike her, I don't live a few miles from an Aldi and a Super Target. I have no where else to turn! Watch out, world's largest retailer. Payback is heck. Oh, it's Monday, isn't it? One of my very favorite Christmas songs. Enjoy. No, the fun never stops at Melz World, my friends! Posing for the camera! She's a natural! 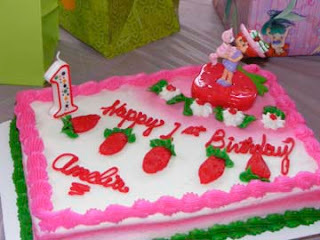 And, with a red head of my own, I'm sorta partial to this Strawberry Shortcake cake. 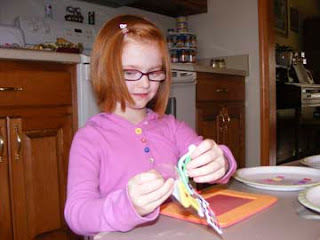 Cheree (my cousin) had a really great idea for a craft. 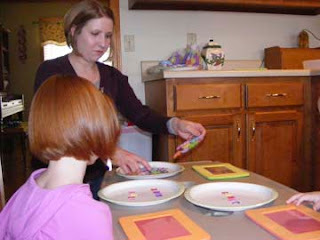 She found some foam picture frames, and sticky foam cut outs, and let the kids decorate. Brilliant! And, of course, my kid zooms past the princess and undersea cutouts, and goes straight for the race car. 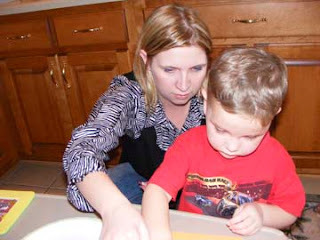 Even little James, who is only three, could do it - with mom Alison's help, of course. Unfortunately, Amelia is still at the age where she's easily distracted and the grownups have to finish the present duties. 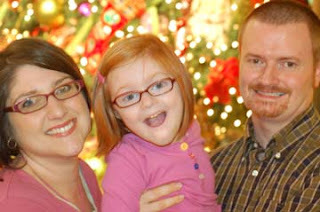 Of course, you know what we did after the party: Christmas pictures. And that was just Saturday! 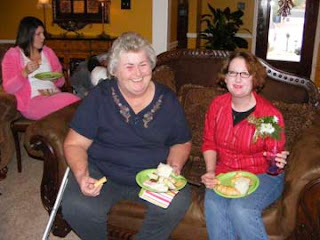 On Sunday, I attended a bridal shower for my BFF Marcia at her sister-in-law Wendy's house. It was so beautiful - it looked like we'd stepped into an issue of Southern Living Magazine! 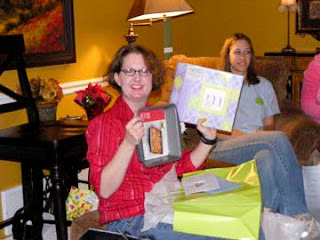 These were my gifts - a cake pan she'd registered for, plus a photo album. Because you can never have too many of those! After the shower, I came home to get Little AM ready for her choir concert. As you may know, she's been riding the choir bus to the local First Baptist on Tuesdays after school. (The pastor's son is a friend of hers). 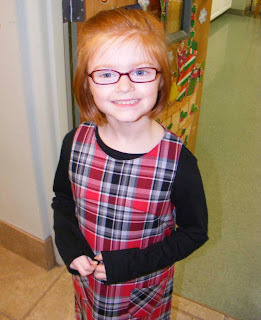 They had their Christmas program last night, and, as you could expect, the adorableness was out of this world. We were pretty far back, so getting a good picture was hard, but as you can tell my daughter is once again the center of attention. Literally. 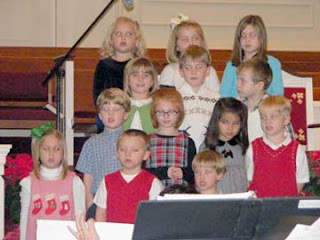 And, she's looking down because that's where the choir director was crouching. The pastor's son is behind her, and the mic was conveniently placed right over him. Wonder how that happened? I'm kinda glad this weekend is over - we've been so dadblamed busy. And next weekend, it's more of the same - a waffle breakfast on Saturday morning, a wedding Saturday afternoon, a church Christmas dinner Saturday night, and another Christmas program on Sunday night. Guess what we finally got around to doing? Taking our Christmas card picture! We've been so busy these past few weeks - I was afraid we wouldn't get it done at all, just like 2004. Complicating the matter was the fact that Amanda no longer resides a stones-throw from me, but has moved an hour away. Yesterday, I woke up with a plan. Well, actually I'd been planning it for a few days, ever since I woke up last Sunday in a panic about the whole process. I knew Amanda would be in Downtown Memphis feeding homeless people, because that's whas she does most every Saturday. 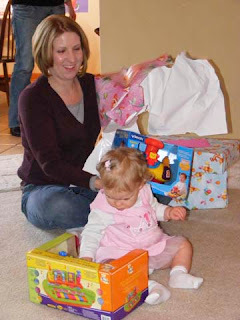 I also knew we has a first birthday party for my cousin Cheree's exceedingly cute daughter Amelia, just across the river from Memphis in Arkansas. I asked Amanda to meet us downtown after her homeless feeding duities were over. And she did! I likewise knew that it would be 4 p.m. or after before any of us could get down there, so outdoor pictures would be out of the question. We parked in our favorite free-parking spot, and walked a couple of blocks to the Peabody Place Mall and their ginormous Christmas tree. Someone in our group was being less-than-cooperative, and kept asking for pizza. And after she was threatened within an inch of her life to never ride the choir bus again, we finally got a usable shot. I stayed up pretty late last night working on these, and they should be waiting on me at Wal Mart when church gets out. Now, comes the fun part - finding the addresses, because neither my ultra-organized husband nor I appear smart enough to save them from year to year. Here's a hint: if it's Friday when I get around to posting, it's not normally good news. Because after a bad weigh-in, I normally go home and walk around in a pity-induced daze. I know I shouldn't let those numbers on the scale get me so down, but I can't help it. I've got to get away from measuring my mood by where those sliders landed on the scale. Anyway. 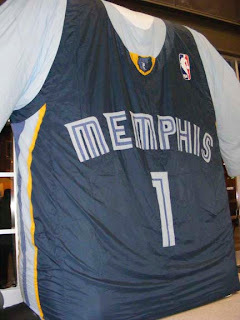 As you can probably ascertain, I didn't have a good weigh in. I gained another 1.5 pounds this week. That's two pounds over the past two weeks, people. This is not meeting my goal of maintaining over the holidays! So, I now weigh 158.5. Again. On another note, I got an email from someone who saw my site somewhere, and she recommended this article on so-called negative-calorie foods. I'm not sure I subscribe to the negative-calorie theory, but eating more fruits and vegetables can't hurt. Neither can actually drinking my water, which I didn't do this week - darn you, Coke Zero and cold weather - but which I've resolved to do full-force this week. What happened to Music Monday? Well, it went the way of the dodo. Not permanently. It's just it was the first Monday of the month, which is really busy for me, and I didn't have time. Anna Marie and I marched (well, actually, I marched, and she rode in the trailer - I think she got the worse end of the deal) in the Senatobia Christmas parade last night. When I got home (and thawed out) I was going to post, but BellSouth was having internet problems. So, no go on the Music Monday. But! I have new product reviews! First off: Little Debbie has redeemed herself in my eyes. After contributing greatly to my chubby childhood, LD has seen the light. 100 calorie packs - of brownies! 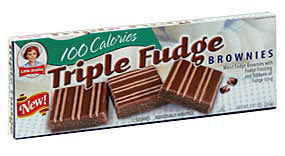 My favorite pre-packaged snack food, Little Debbie Fudge Brownies, now in a more manageable size! And gingerbread men! Soft and chewy, and 100 calories! Brilliant! 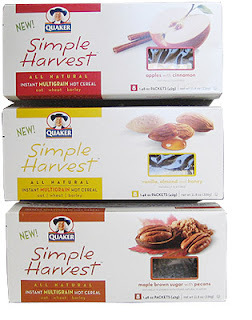 I've also been wanting to try the Quaker Simple Harvest oatmeal for a while, because the commercials made it look good and hearty and oat-y. So yesterday I broke down and bought some to leave at work, for those mornings when I don't have time to eat before I leave home. My usual on-the-go breakfast is a Fiber One bar and a Coke Zero, but I figured this might be a wee bit healthier. Holy smokes - this stuff is good! Our local Big Box Retailer only carries the Apple flavor, but it's great! It's really much better than most instant oatmeal I've had. I could purposely skip my Kashi GoLean for this stuff. I can't wait to get my grubby little paws on the other two flavors. Fudge brownies I can control myself around. And oatmeal that cooks up to perfection in 60 seconds. Thank you, Little Debbie and the Quaker Oat Man. You've made this little brunette very happy.